Welcome to WTKSoftware.com! Start running your Network marketing / Affiliate marketing / Direct marketing business today, using our affordable Network Marketing Software! 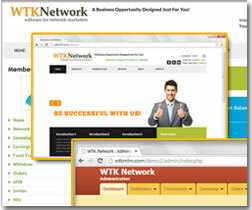 WTK MLM SOFTWARE is a powerful, feature rich web application designed for Network Marketing Business. This application lets you start running your network marketing / affiliate marketing / direct marketing business quickly. This web based MLM software automates various aspects of the business, making it easy for you to run a large business with little intervention and less administration effort. It supports online payment gateways like paypal, payza(alertpay), authorize.net, skrill(moneybookers) with automatic distributor activation, inbuilt shopping cart, instant commission payment to ewallet, replicated websites, recurring fees etc.